Secrets & Mysteries of the Beekman Bank | Historic Jacksonville, Inc. 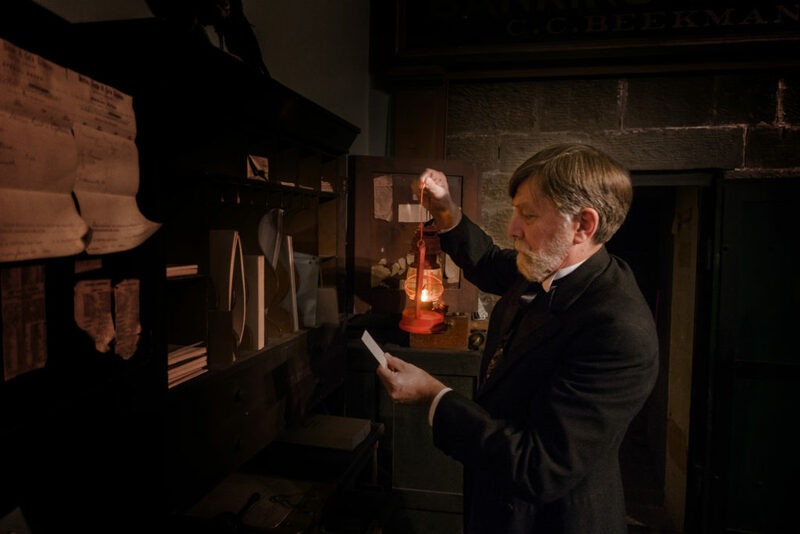 Explore the “Secrets & Mysteries of the Beekman Bank” on the first Friday and Saturday of each month through May when Historic Jacksonville, Inc. opens the oldest financial institution in the Pacific Northwest for evening candlelight tours. Established in 1856 as a gold dust office, the current 1863 Beekman Bank building was constructed by Cornelius C. Beekman at 110 W. California Street in Jacksonville when he became the town’s Wells Fargo agent. Over $40 million in gold crossed Beekman’s counters during Jacksonville’s heyday in the 1800s—equivalent to almost $1 billion in today’s currency! The mint was in San Francisco, yet Beekman was never robbed. How did he safely ship his gold under the noses of the highwaymen? Fires destroyed all the wooden buildings surrounding the Bank. Why is the building still intact? Beekman ordered large quantities of opium. Was he a drug dealer? Beekman was supposedly happily married. Why was there a ring in his safe inscribed “Lois to Beek”? What was Beekman’s “office” really used for? Regional historian Ben Truwe pursues these and other secrets and mysteries in 45-minute candlelight tours beginning at 6, 7, and 8 p.m. in February and March and at 7 and 8 p.m. in April and May. Truwe used his opportunity as a Bank docent to explore the building and make discoveries of secrets lost with the last Beekman. Bring a flashlight to make your own discoveries! Admission is $5 per person with proceeds benefiting the preservation and maintenance of this regional landmark. Tours are limited to a maximum of 12 people and reservations are required. Reservations can be made by calling Historic Jacksonville, Inc. at 541-245-3650 or e-mailing info@historicjacksonville.org.